Entertaining for a crowd? 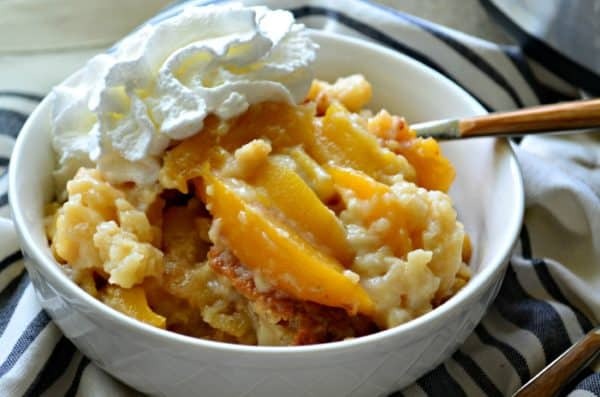 Try my easy recipe for slow cooker peach cobbler. It’s an incredibly easy way to get your summer cobbler fix. By now, if you know me, you know that I love cobblers. Especially peach cobbler in the summertime! I typically make a cobbler every other week in the summer, embracing the fruits of the season. I’ve made peach cobbler in the skillet, I’ve shared how to make traditional peach cobbler, and now today I’m excited to share how to make peach cobbler in the slow cooker. I’ve started embracing the slow cooker more and more for desserts. I kind of love it. When I’m entertaining, I rarely make a dessert and most of the time I’ll buy it because by the time I’ve worked on the main meal I’m exhausted and can’t think about dessert. And that’s why I’ve started turning to my slow cooker more. Confession: I own two slow cookers. Really I owned 3 and then my husband made me give my cousin my third slow cooker because he felt like I had too many. Little did he realize I use them for not only dinner but dessert too! At a family barbecue earlier this summer we had 5 slow cookers plugged in with various side dishes and desserts! FIVE! Never enough slow cookers in my opinion. 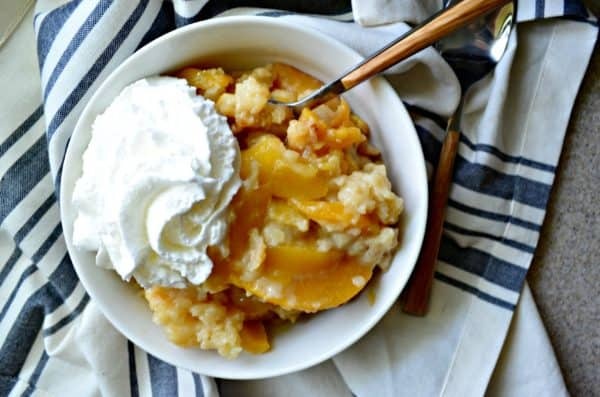 So let’s talk a minute about how easy it is to make slow cooker peach cobbler. First you’ll melt butter. You’ll want to brush the butter on to the sides of the slow cooker. Then you’ll make the batter. You can use a stand mixer, mix it by hand in a bowl. Heck, I’ve even mixed this batter in a zip lock baggy. No joke. Just mix it. Then pour it in the slow cooker. Then top with frozen peaches. They can be thawed, they can be fresh peaches — just make sure you take the skin off. Either way works. The slow cooker is going to cook the batter to make it cake like and the peaches will just melt right into it. Put the lid on and let that baby cook for 3 glorious hours. The number one rule when cooking with your slow cooker is you do not remove the lid. If you remove the lid you have to increase the cooking time. Slow cooking is all about steaming and cooking evenly. That’s why cobblers work well in the slow cooker. After 3 hours (or once you notice the batter has turned cake like), it’s time to scoop, divide evenly among bowls and enjoy. Oh and don’t forget the vanilla ice cream. 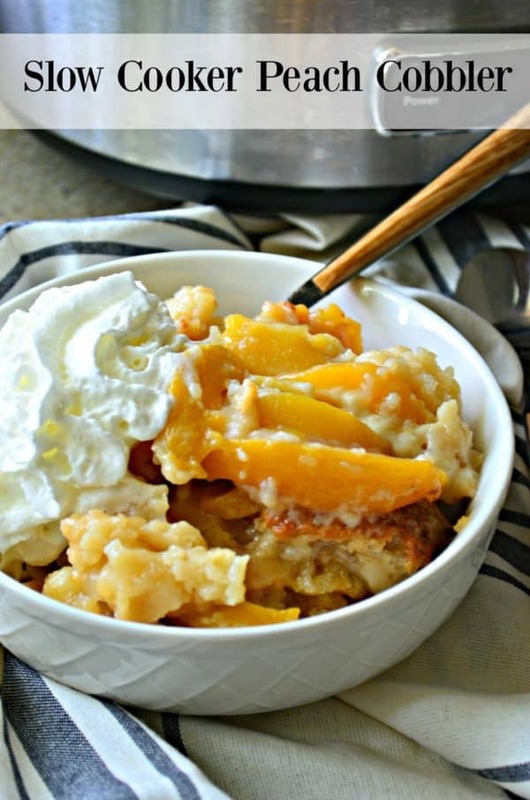 You have to have vanilla ice cream with my slow cooker peach cobbler!